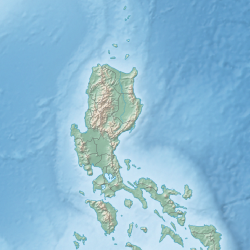 Balayan Bay is a large bay of Luzon Island in the Philippines. It is part of the Verde Island Passage and its entire shore is in the province of Batangas. The bay is between 23 to 28 kilometres (14 to 17 mi) wide. It is separated from the South China Sea to the west by the Calatagan Peninsula, which has Cape Santiago as its southern point. The Calumpan Peninsula forms the bay's eastern side, that separates it from Batangas Bay. The following municipalities line the bay from west to east: Calatagan, Balayan, Calaca, Lemery, Taal, San Luis, Bauan, and Mabini. ^ Hopkins, Daniel J., ed. (2007). Merriam-Webster's geographical dictionary (3rd ed., rev. ed., updated ed.). Springfield, Mass. : Merriam-Webster. p. 105. ISBN 0877795460.